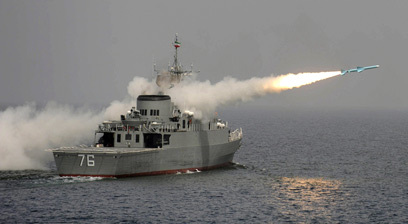 Iran said Monday that is has successfully test-fired long-range missile during the last day of its naval exercise in the Gulf, the State news agency IRNA reported. "We have test fired a long-range shore-to-sea missile called Qader (capable), which managed to successfully destroy predetermined targets in the Gulf," deputy Navy Commander Mahmoud Mousavi told the official news agency IRNA. Iran earlier said it would test fire two long-range missiles on Monday, Qader and another system called Nour (light), to display its resolve to counter any attack by enemies such as Israel or the United States. Both missile have a range of 200 kilometers. The test follows various threats made by Tehran to halt oil shipments through the Strait of Hormuz. Iran has been holding the 10-day naval exercise at a time of increased tension with Western powers over its nuclear program, and Mousavi said on Sunday it had successfully test-fired a medium range surface-to-air missile. Tehran threatened last week to stop the flow of oil through the Strait of Hormuz if it became the target of an oil embargo over its nuclear ambitions. The European Union has said it is considering a ban, already in place in the United States, on imports of Iranian crude. The US Fifth Fleet said it will not allow any disruption of traffic in the vital oil shipping route. The United States and Israel say they have not ruled out military action against Iran if diplomacy fails to resolve a dispute over the nuclear program, which Tehran says is peaceful but the West believes is a cover for trying to build atomic bombs. Iran has long-range missile systems, which could reach Israel and US bases in the Middle East. See all talkbacks "Iran test-fires long range missiles"